Nelson region is known for its year-round sunshine, golden beaches, three national parks, 300-plus working artists and craftspeople, boutique wineries, fresh local produce and seafood, historical streetscapes, waterfront cafes and restaurants, and a thoroughly relaxed lifestyle. 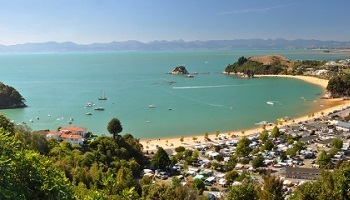 Nelson, named after Admiral Lord Nelson of Battle of Trafalgar fame, is the main commercial centre for the region, whose main industries are forestry, horticulture, fishing and tourism. 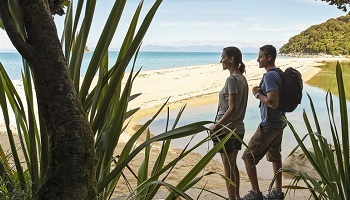 The smallest of the New Zealand's national parks, Abel Tasman is a compact treasure house of nature with glittering beaches, turquoise water and spectacular ocean views. A range of wildlife inhabits the area, including penguins and a seal colony in the Tonga Island Marine Reserve. • Day trips or overnight stays: water taxis can drop visitors into the Park to walk sections of the Track. Visitors also have the option of staying a night in a variety of accommodation styles. 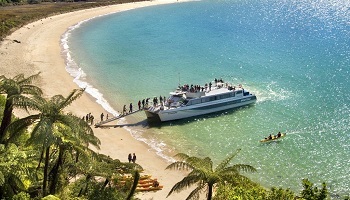 There are also day cruises and nature tours that include walking through the Park.